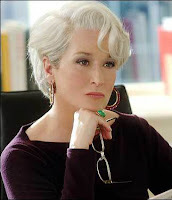 In one of the best (and most surprising) movies of 2006, Meryl delivered the performance of the latter half of her career as relentless and terrifying Miranda Priestley in The Devil Wears Prada. It's the movie that ushered in Ms. Streep as a box office sensation for a new generation of moviegoers. And though this transition has yielded us such resulting products as Mamma Mia!, it's also given us the success of both Julie & Julia and It's Complicated, two rather delightful movies of 2009. But back to Prada. Streep's Miranda is calm and collected in the eeriest of ways. She proves to be one of the best villains in recent memory with her slight facial tics that could take down an entire army. From the cerulean speech to the "oops, I saw you fighting with your husband" retaliation, Miranda is certainly the devil to Anne Hathaway's new personal hell. 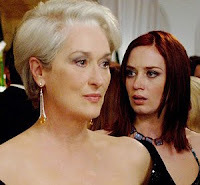 But what makes Devil Wears Prada one of the best movies of its release year isn't Meryl's wicked performance alone, it's the supporting turns from the snippy Emily Blunt and the cool-mannered Stanley Tucci. As, well, Emily, Blunt is the epitome of short-tempered, high-powered assistant. Whether bashing the style of her frumpier counterpart or groveling at Miranda's feet at every chance, Emily is the type of evil sidekick you can't help but root for. And Tucci's work as the zinger-throwing fashion editor who takes Hathaway's character Andrea under his wing is subtle at the right times (unlike some of his recently honored over-the-top work). But I digress - this is Streep's show, and she makes it known at every opportunity. It's difficult to make a character recognizable by name, but somehow Streep manages it on occasion - Sophie Zawistowski, Karen Silkwood, and Miranda Priestley are all examples of possible future Scarlett O'Haras and Ilsa Lunds. Am I getting ahead of myself? Probably. But isn't it intriguing to think of who the future iconic names from film will be in 20 or 30 years? Have we found a Don Corleone or an Annie Hall? It seems that one of the best places to look for these such characters has to be in our greatest living actress. I didn't like the movie, but Meryl and Stanley Tucci are amazing in it. It definitely had its low points *cough* Adrien Grenier *cough* ... but I try to just block them out, I guess.